Every once in a while, I read a book that has no ratings or reviews by people I trust, hoping to discover a hidden gem. And every once in a while, though not as often as I’d like, I actually succeed (which, I freely admit, happens to be very good for my ego). 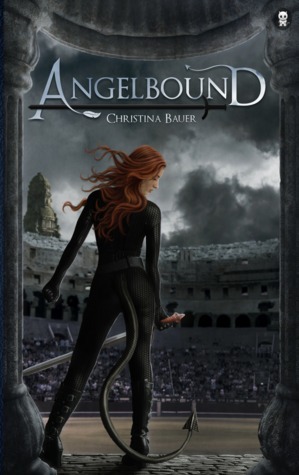 Angelbound is one of those gems I’m thrilled to have discovered. I picked it up on Netgalley not expecting much at all and I ended up reading it in one sitting. This YA paranormal fantasy is cute, compulsively readable and above all fun. Myla is a quasi-demon – a half demon, half human 17-year-old girl enslaved by ghouls in the Purgatory. She did nothing wrong to end up there; her species used to rule the realm until Armageddon, the King of Hell, allied himself with the ghouls and helped them in their rise to power. Aside from going to school where she learns all about being a good slave to the ghouls, Myla fights in the Arena against souls that choose trial by combat in their afterlife. Her opponents are always the most wicked of souls and it’s Myla’s job to make sure they don’t win against her, thus earning a one-way ticket to Heaven. Luckily for everyone, Myla is very good at what she does. Myla is a magnificent heroine, fierce and outspoken, hilarious and mischievous, and yet compassionate and mature when the need arises. As fascinated as I was by the worldbuilding, it was Myla who turned this book into something memorable. This girl never faltered, she fought back with a healthy dose of humor and an arrogance I would probably hate in anyone else. I do love a girl who knows her strengths. And did I mention that her demon tail is sentient? Best. Sidekick. Ever. When Lincoln, the High Prince of the Thrax first appeared, I disliked him so intensely, I didn’t think there was any hope for his character. But only a boy equally skilled and equally arrogant could ever hold Myla’s interest for a longer period of time, and the prophecies soon proved true – they were indeed perfectly matched. What started as an awfully antagonistic relationship, ended up being one of the sweetest, drama-free romances I’ve come across in a very long time. Don’t you just love it when couples present a unified front in all things? Ah, but here’s the real treat: Bauer took the very basic Heaven-and-Hell outline and then built upon it, creating five realms with rich history, each ruled by a different race. Usually, the word ‘angel’ on the cover of any book is enough to make me shudder, but thankfully, I didn’t let my prejudice stop me from requesting this, and thank Heavens for that! The secondary characters, with the unfortunate exception of Myla’s best friend Cissy, are all very lovable and interesting. I could have done without the focus on Cissy and her love life in the first half, but when Myla and Lincoln took center stage, the annoyance was quickly forgotten. As far as narrative techniques go, I’m usually not a fan of flashbacks, but these dreamscapes in which Myla discovered the truth about her mother’s past were perfectly timed and reasonably short, so I found myself enjoying them despite myself. Fans of interesting worldbuilding, fans of romance, fans of kickass heroines, fans of great fight scenes, fans of all of the above… I believe you’ll all find plenty to love about Angelbound. Although it ends cleanly and beautifully, I can’t wait for the release of Scala in May 2014. I have this one on my Kindle as well and I'm really excited about it ;) hope it is good! This sounds like a very unique Gladiator meets the supernatural type of story! Definitely sounds like something different from the usual Heaven/Hell stories and your review has got me intrigued to check it out! Ooooohhhhh, this sounds good. I love discovering hidden gems, so this is going straight onto my TBR. I seriously can't wait to meet these characters and fall for their romance; plus, world-building is always the cherry on top! ;) Fantastic review, Maja! Well now I simply have to read this Maja, I've never read a book where a character has a sentient body part. That is AWESOME:) It's so funny, but since I started the blog, all the books I read are based on recommendations or reviews, I almost never try anything without hearing at least something about it first, but before I started the blog I'd just pick up anything that sounded good, reviews or no. I love that you gave this one a try despite not knowing much about it, and I love even more that it was a winner! Ok, I had given this one a look, and thought it might be as interesting and original as Cracked was, but the mention of High School for demons kinda made think wha?. But now I know that I must give this one a chance for sure! Thanks for discovering this gem for us!! I am glad you found a good one Maja! It's kind of nice to read a book with no reviews once in awhile and have no expectations. I remember seeing this cover, but I think that's about it. It definitely sounds like something I might really enjoy so I might have to consider adding it to the pile! I saw the cover on some blogs but it's the first review I read. And once again I was sure it was an adult story. LOL I definitely need to stop juge by the cover. I love the sound of this one I confess, I'm always intrigued by demons stories. Maja you have me curious, usually YA paranormal are just meh for me, but this sounds wonderfully executed and even the cover is cool. I am glad you took a chance, because I am adding it to my list. ahh of course the book I pass up on and you write this lovely review on! Of course that means my grabby hands had to go and get it :) I cannot wait to enjoy it! oooh, yay! I love a good paranormal. I'll be adding this one to my TBR list. good job finding this one. I'd not heard of it. I put a checkmark by everything you mentioned in the last paragraph. Isn't it nice once in awhile when an blind, impulse request actually pays off? I haven't had too much success with angel/demon novels but love them regardless so I'm thrilled that you've made me aware of this one, Maja. It sounds exactly like something I'd enjoy! I'm just returning to say THANK YOU! Maja, I finished Angelbound today and loved it to bits! Myla is awesome and the sort of character I simply love! I'm so so glad you found this one for us!